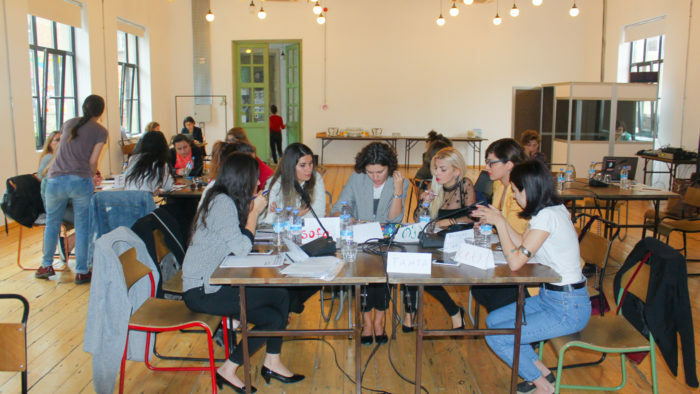 Aiming to strengthen the participation of young women human rights defenders in politics and society, Human Rights House Tbilisi (HRHT) and France-based NGO IREX Europe organised the “National Leadership Academy” in Georgia for women human rights defenders. 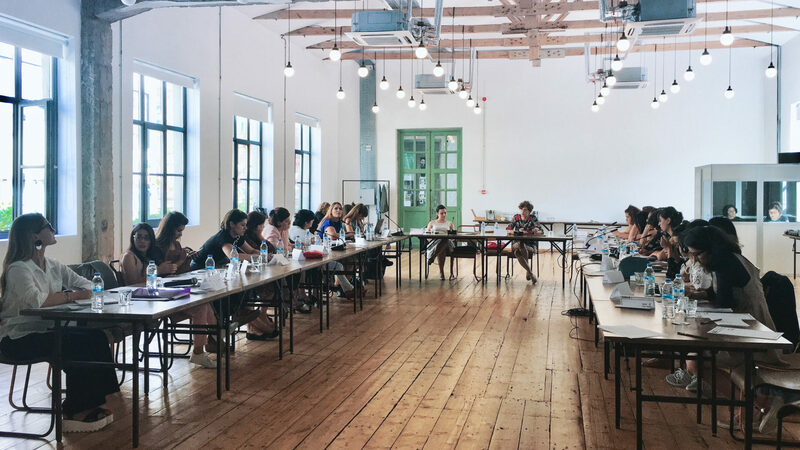 Held from 25-27 September at the conference hall of “Fabrika”, the academy was implemented under the 26-month project “Promoting New Women Leaders and ‘Invisible Women’ Human Rights Activists.” This project covers five countries, including Georgia, and is financially supported by the European Union. Over three days of training, the Academy covered gender equality, equality within the workplace, advocacy, creative campaign planning, and media campaign planning. The diverse group of participants consisted of young women human rights defenders from different fields of work, such as on ethnic minority rights and transgender rights. Participants came abroad, such as from neighbouring Azerbaijan, as well as the regions of Georgia. “I will bring the knowledge and experience gained in the Academy to my region, Telavi, to use it in practice. I hope that this kind of assistance to the women from regions of Georgia will continue,” commented Monika Tigishvili, Resource Center Manager (Equality Movement) from Telavi, Georgia. The trainers and speakers were equally diverse, including representatives from human rights organisations, academia, parliament, trade unions, and digital agencies. 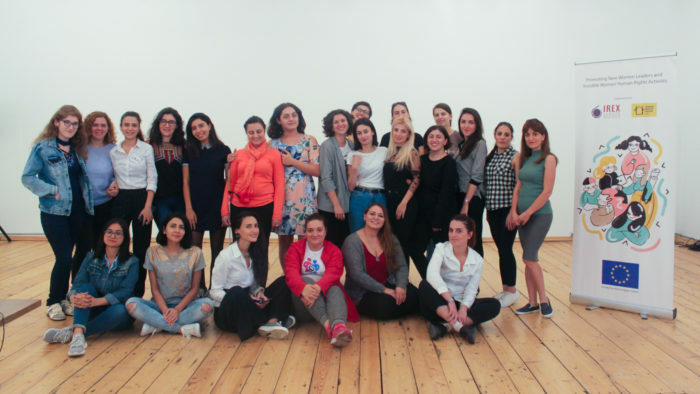 Giorgi Urchukhishvili and Baia Pataraia from “Sapari”, member organisation of HRH Tbilisi, conducted sessions on the sociology of gender and gender equality. From the Georgian Trade Union Confederation, Raisa Liparteliani held a session about gender discrimination in the workplace and mechanisms for achieving gender equality. On advocacy, Baia Pataraia held sessions on this at the national and international levels, while guest speaker Ana Natsvlishvili, Parliamentary Secretary of the President of Georgia, discussed specific examples of advocacy within NGOs. Eka Gigauri, Director of Transparency International Georgia, talked about the problematic aspects of communication with embassies and diplomatic corps. Focused on campaign planning, trainers Nino Danelia (Ilia State University) and Salome Jvania (digital agency Leavingstone) discussed media campaign planning and creative campaign planning respectively. Based on their motivation, proactivity, and commitment, a few of the participants will be selected to attend the Regional Leadership Academy, which will be organised in Chisinau, Moldova. Several participants will also be eligible to get funding for their projects. This was the first round of the National Leadership Academy in Georgia. The second will be organised in 2019.